Swaddled in a colourful wrap, the baby is surrounded by syringes used by her mother. 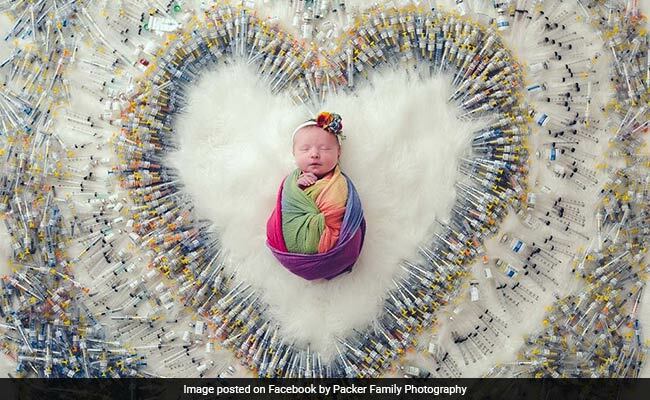 A photograph of a newborn surrounded by syringes arranged in a heart has touched a chord with thousands on Facebook. The picture, that's worth the proverbial 1,000 words, portrays the challenges of In Vitro Fertilization (IVF). Since being posted on August 11, the photo has collected over 70,000 reactions and more than 55,000 shares - and still counting. The photograph was clicked and posted on Facebook by Packer Family Photography. "Mom said, '4 years, 7 attempts, 3 miscarriages and 1,616 shots'," says the caption. That's exactly what Patricia O'Neill and her wife Kimberly went through to finally have their "miracle" baby. Swaddled in a colourful wrap, the baby is surrounded by those same syringes collected by her mother. "When we started our journey we thought, 'Oh this should be easy. We pick a donor and do a round of IUI (Intrauterine Insemination) and in nine months we will have our baby!' Boy were we wrong!" Kimberly O'Neill told NDTV via email. When two rounds of IUI failed, the couple moved on to IVF. After several failed attempts, the couple found out Patricia was pregnant again. "Each visit (to the doctor) we were on the edge of our seats waiting for something bad to happen. Each visit was just as scary as the last," Ms O'Neill said. "Then August 3, 2018 our miracle arrived!" The couple always wanted their baby's picture the way it has been clicked. That's why they saved every syringe. The moving picture has drawn thousands of heartwarming comments. "It's a beautiful shot and an amazing story," says one Facebook user. "I have never thought hypodermic needles were beautiful until now," says another. The couple didn't expect the picture to go viral but hopes it can help others. "We never dreamed the picture would go viral the way it has! We love that it can bring hope to others because a fertility journey is unlike anything we have ever experienced," said Ms O'Neill.